The Border Force will re-advertise for 21 new jobs in Northern Ireland, dropping a previous requirement that candidates must have a British passport, the Home Office has said. The Equality Commission had registered its concern that it could lead to possible discrimination by "excluding a large section of the population". The Home Office has apologised for what it has said was "an error". It said it should have read "'a full and valid passport'". 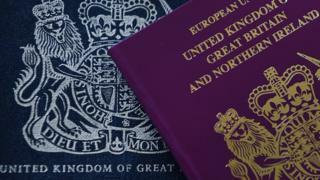 The original requirement for applicants to the Border Force to have British passports drew criticism from nationalist politicians, some of whom referred the matter to the Equality Commission. "In view of this being brought to our attention, the decision was taken to stop the campaign, correct the wording and re-advertise," the Home Office added. "This is to ensure that no eligible candidates are disadvantaged." Candidates who have already applied will have their applications carried over. Anyone else interested in applying will have two weeks to do so after new adverts with corrected wording go live.